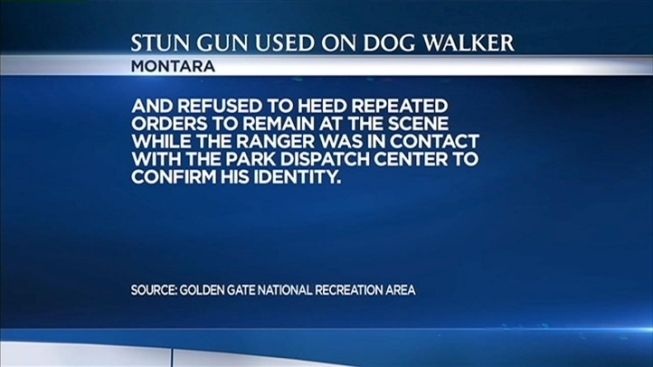 Congresswoman Jackie Speier is asking an independent party to investigate whether park regulations were violated and excessive force was used in an incident Sunday in which a park ranger used a Taser on a dog walker in the Golden Gate National Recreation Area near Montara. Speier sent a letter to GGNRA Superintendent Frank Dean expressing her concerns and requesting information about the incident in which Gary Hesterberg, of Montara, who was walking his dogs off-leash, was Tased. "Many of my constituents are understandably angered by what appears to be an excessive use of force by a park ranger," Speier said "From the information I have to date, it does not appear that the use of a Taser was warranted." Speier, who worked closely with state officials on the use of tear gas, stun guns and pepper spray while she was in the California Legislature, requested information about training in Taser usage for park rangers and asked how the public was informed about dog policy changes at Rancho Corral de Tierra. All dogs are now required to be leashed in the recreational space. According to Montara resident Michelle Babcock, who witnessed the confrontation in the Rancho Corral de Tierra open space area on Sunday afternoon, a female ranger had detained the dog owner for walking his two small dogs without a leash. Babcock said the man the ranger was citing had already leashed his dogs and provided the ranger with all his personal information. According to Babcock, the dog owner repeatedly asked why he was being detained, and eventually told the ranger to cite him or he was going to walk away. "He started to walk away and she told him that she would Tase him if he walked another step," Babcock said, adding that the man turned and the ranger deployed her Taser, causing the man to fall to the ground. Advocate groups for dog owners -- such as Montara Dog and DogPAC of San Francisco -- have asked the National Park Service to investigate the incident and cease ticketing dog walkers in Rancho Corral de Tierra. GGNRA officials issued a statement Tuesday saying they have initiated a review of the incident. According to the statement, the dog walker provided false information to the ranger and refused the ranger's repeated orders to remain at the scene while his identity was confirmed. The 3,800-acre property was transferred to the park service by the Peninsula Open Space Trust in December.